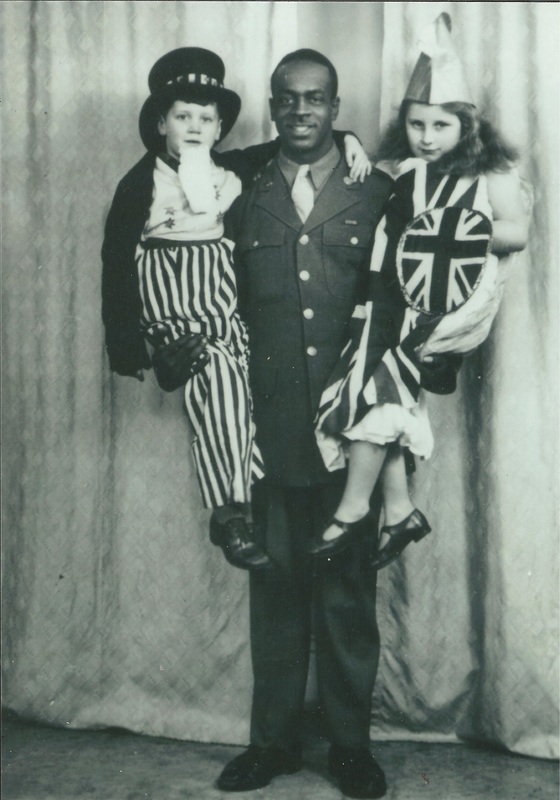 Wylie Young was a Black American serviceman, stationed at the U.S. Army camp at Harland Way, Cottingham in the early 1940s. The following story (and associated photograph showing Wylie with Ena Stephenson and Alan Bernard Gulliver - see right) has been passed down through the family. Every Saturday night, Ellen Cole (formerly Gulliver) attended dances at the King Street Rooms, Cottingham, along with Ena Stephenson’s grandmother (who was a caretaker). Ellen owed her job as a cloak room attendant to her. Wylie Young and a number of other Black serviceman from the army camp were also in the habit of going to these dances. Ellen met Wylie there (this was sometime in 1942) and got into humorous conversations with him. He is said to have been a proper gentleman, very respectful and also very handsome. Because of the wartime blackouts, Wylie insisted on walking Ellen home to her house in Finkle Street. Over several weeks she invited him in for a "cup of English tea" and he eventually accepted the invitation – "that would be nice ma’am". He brought along a number of special treats, which all the family enjoyed during his visits – Britain was of course under rationing and life was pretty austere, with a limited diet. direct and firm – "Colonel, you are not in America now. If I want to socialise I will, it’s my home and that’s the end of the matter". The Colonel responded – "Point taken ma’am, thank you for your time Mrs Cole". Wylie was so taken by his kind treatment that he arranged to have his photograph taken with the children at Jerome’s photographers in Whitefriargate. He wrote home to his parents in the U.S. telling them the story and sent the photograph because he thought that his family would never believe he had been photographed with two white children and so that they would able to pass the copy around the family. One day, probably late in 1943, Wylie was due to come for afternoon tea and he never turned up. Evidently, the regiment had been confined to barracks before it was due to move to a new location in the south of England, as part of the build-up for D-Day. Ellen never saw Wylie again, something she was very sad about. Unfortunately, it is not known precisely where Wylie came from, nor which regiment he was serving in at the time. Do you remember anything about the African American Servicemen at Cottingham during the 1940s? Do you remember Wylie Young or any of the other African American servicemen? Do you have any memories, pictures, letters that might help us add to this story or that of the African American Servicemen at Cottingham? If you would like to help or have any further information please click on our submit button below to contact us.